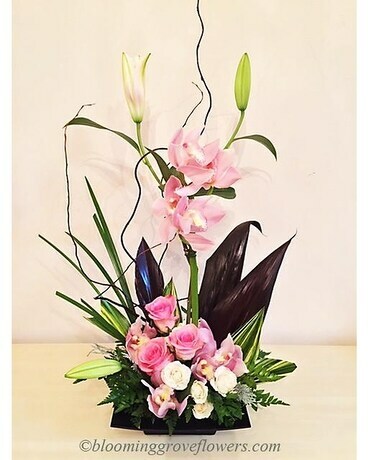 Beautiful arrangement for modern style lovers: lilies, cymbididium orchids, roses, spray roses, premium greenery, decorated with willow branches, in a shallow container. ***Note: Exact flowers and presentation may vary with seasonal and local availability to assure the best quality and selection for your special gift. Flowers/ colors could be changed to accommodate your needs. Please call to discuss.